If you had answered yes (or even if you didn’t) do swing by the Hilton this weekend to take a look at their latest offerings! 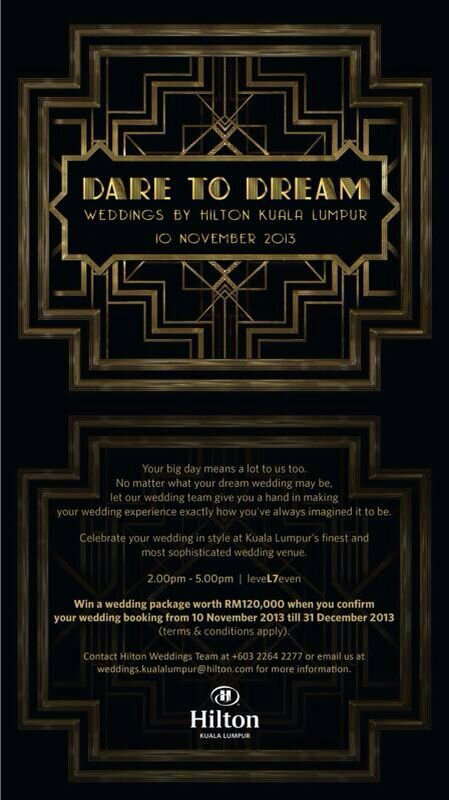 As a deal sweetener, sign up for your wedding with the Hilton, and stand a chance to win a dream wedding worth RM120,000! Yes, you read that sentence correctly, its RM120,000, an amount sufficient to have an amazing event, with all the bells and whistles thrown in! Along with a host of other wedding professionals, I’ll be there to showcase my designs, in a venue themed after The Great Gatsby (think 1920’s opulence, and you’re about there) so do drop by to say hi! For more info, do visit the Hilton page.